One of the key activities of SENDA is the production and trade of vegetable oils. We sell such types of oils as sunflower oil, soybean oil, rapeseed oil and corn oil. The available facilities allow us to have monthly output from 200 to 500 tons of own-produced soybean oil. 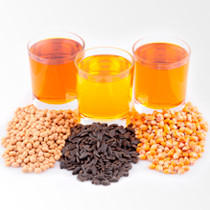 For extraction of vegetable oils SENDA uses only high-quality oilseeds (sunflower, soybean, rapeseed and corn seeds). Our vegetable oils are compliant with all national standards, produced with application of the cutting-edge technologies and popular among a large number of consumers. Want to assess the quality of our vegetable oils? We are ready to provide samples of products that will allow you to decide on the future purchase.